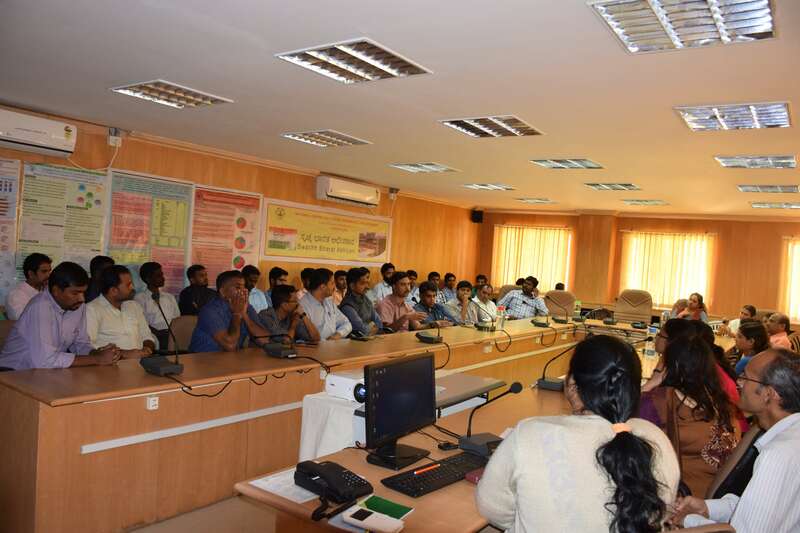 Interactive session with ethics committee members, researchers, students on National Ethical Guidelines was held using videoconferencing in three different halls to accommodate large number of participants at Andhra Medical College, Visakhapatnam. Awareness programme on Swachh Bharat Mission (Swachhata Action Plan) on 20th Dec 2017 at NCDIR, Bengaluru. 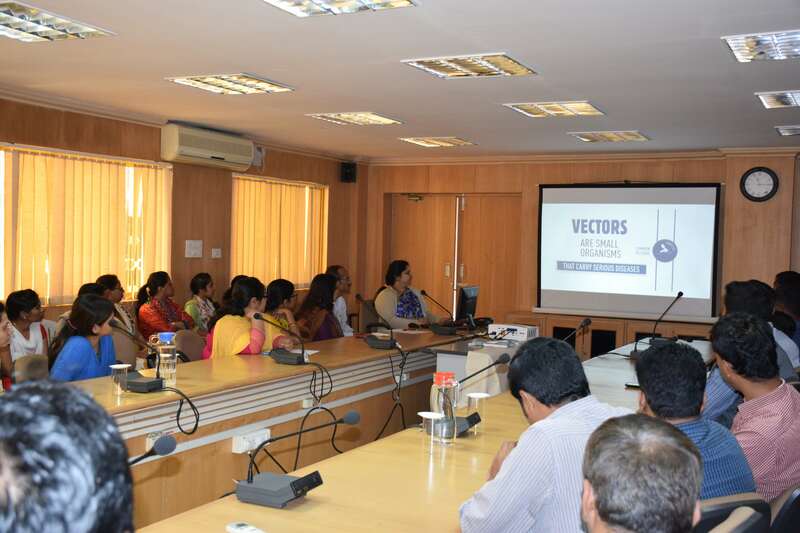 An awareness program on Swachh Bharat mission was conducted at ICMR - NCDIR, Bengaluru on 20th December 2017 in which Swachh Bharat Pledge was administered to the staff of ICMR-NCDIR and an awareness talk on “Vector Borne Diseases and its Prevention” was delivered. 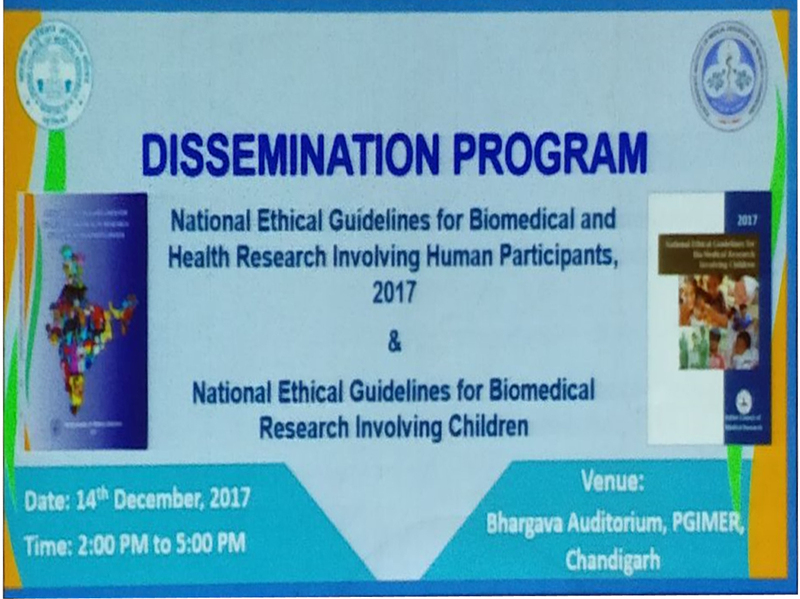 Dissemination programme on the revised ‘National Ethical Guidelines for Biomedical and Health Research Involving Human Participants, 2017’ and ‘National Ethical Guidelines for Biomedical Research Involving Children’ was held at Bhargava Auditorium, Post Graduate Institute of Medical Education and Research (PGIMER), Chandigarh on 14 December 2017. 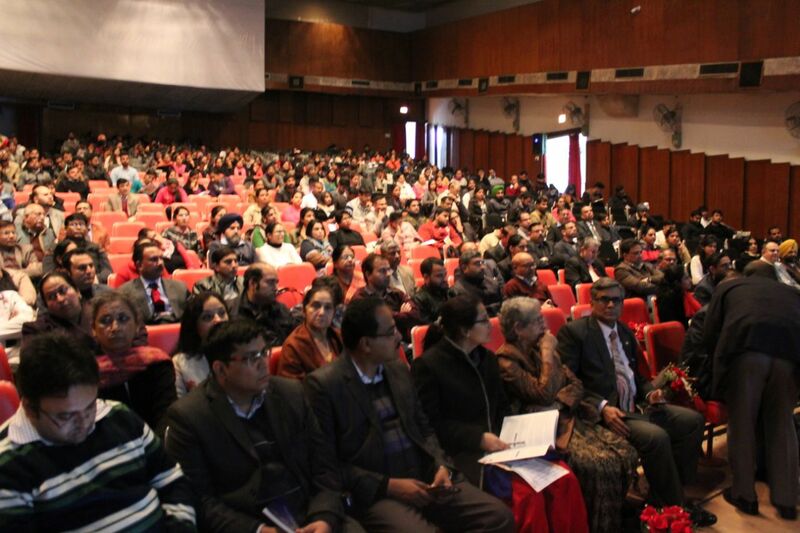 More than 1380 participants from all parts of the country attended the program and benefitted from the interactive discussions and obtained newer updates on the topic. National Technical Working Group (TWG) on NCD Surveillance met on December 8, 2017 to review progress of National NCD Monitoring Survey 2017-18 at NCDIR, Bengaluru. The Group was apprised on the current status of the Survey and the challenges faced since initiation of field activity from mid October 2017. The TWG recommended that surveys on similar line have to be planned and implemented by the concerned states with technical support from the experts. This will help to arrive at state level estimates on prevalence of NCD risk factors in Indian population and will lead way for NCD Policies & Program implementation. Annual Review Meeting of NCDIR – NCRP held Amrita Institute of Medical Sciences, Kochi from 28 to 30 November 2017. Annual Review Meeting of NCDIR – NCRP was held at Amrita Institute of Medical Sciences, Kochi from 28th to 30th November 2017. The members of Research Area Panel Cancer of NCDIR, Investigators from 33 Population Based Cancer Registries, 9 Hospital Based Cancer Registries and 8 HBCRDM centres have participated in the meeting. Poster presentations, panel discussions, Release of flyers on cancer burden of Kerala state and release of the newsletter of NCRP Cancer Registry Abstract(CRAB) were the highlights of Annual Review Meeting. 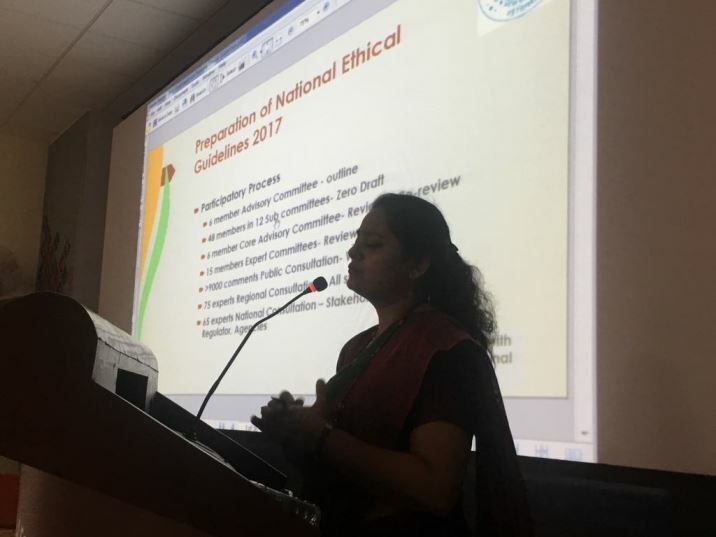 NCDIR-CDSA Dissemination of ICMR National Ethical Guidelines at AMC MET, Ahmedabad on 30th November 2017. 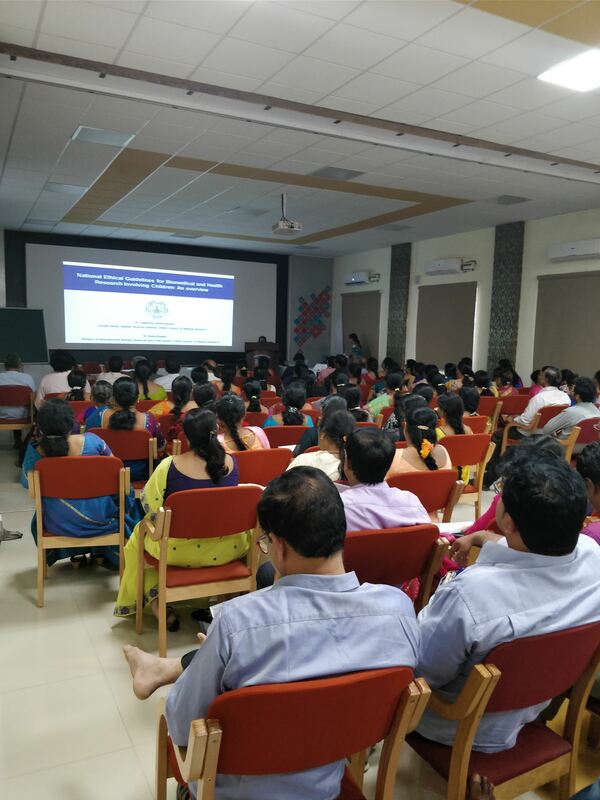 NCDIR - CDSA Dissemination of ICMR National ethical guidelines was conducted at AMC MET Medical College, Ahmedabad on 30th November, 2017. 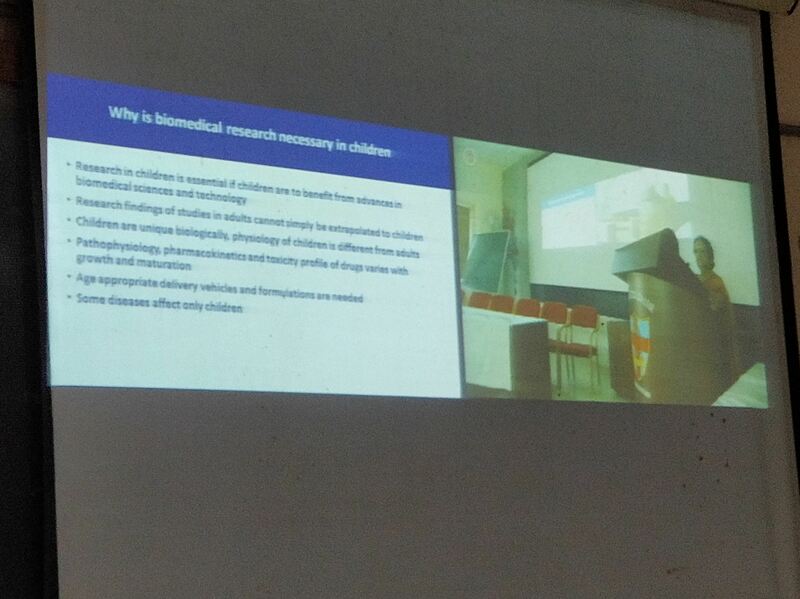 During the program, highlights of National Ethical Guidelines for Biomedical and Health Research involving Human Participants, National Ethical Guidelines for Research Involving Children and National Guidelines on Stem Cell Research were presented and discussed. The program was attended by a very large number of participants across the state of Gujarat as well as other parts of the country. Constitution day was observed at NCDIR on 24 November 2017. 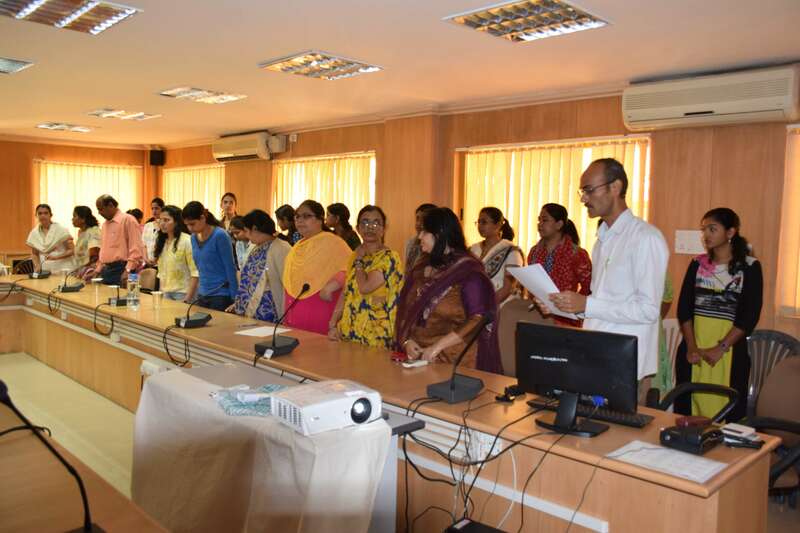 Mrs. Priyanka Das, Vigilance Officer of NCDIR explained the significance for commemorating this day and then the Preamble to the Constitution was read out aloud by all staff. 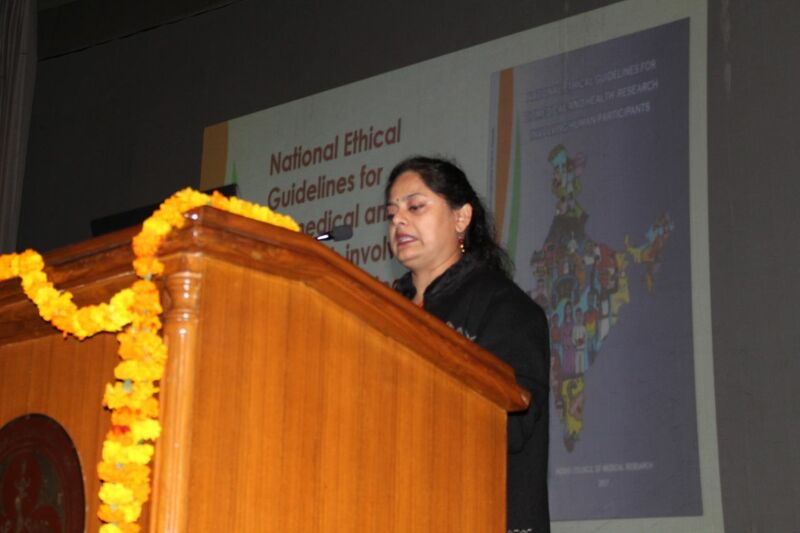 The National Ethical Guidelines for Biomedical and Health Research Involving Human Participants and National Ethical Guidelines for Biomedical Research Involving Children have been developed after long and careful deliberations with experts and stakeholders from various disciplines and constituencies across the country and address newer concerns, in accordance with the socio- cultural milieu of our country. These guidelines were released by the Hon’ble Minister of Health and Family Welfare and Hon'ble Minister of State for Health & Family Welfare on 12th Oct 2017 at ICMR Headquarters, New Delhi. 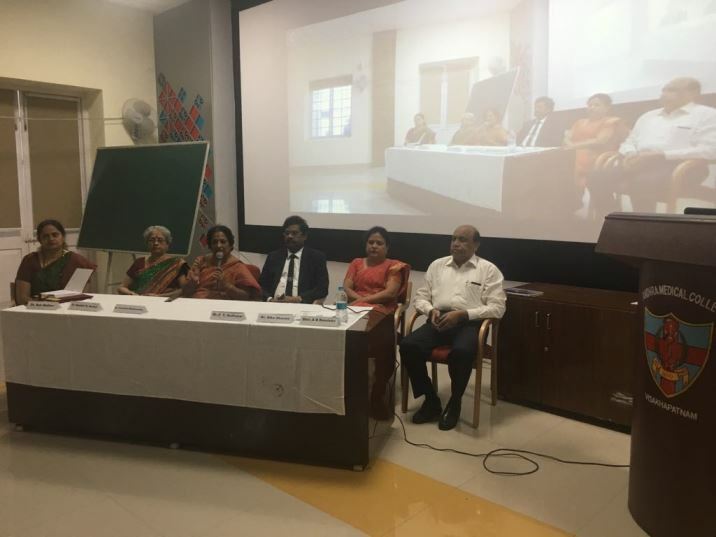 In order to create awareness amongst all the stakeholders such as clinicians, researchers, ethics committee members, students, and others involved in biomedical research, a dissemination program was held on 16th November 2017. 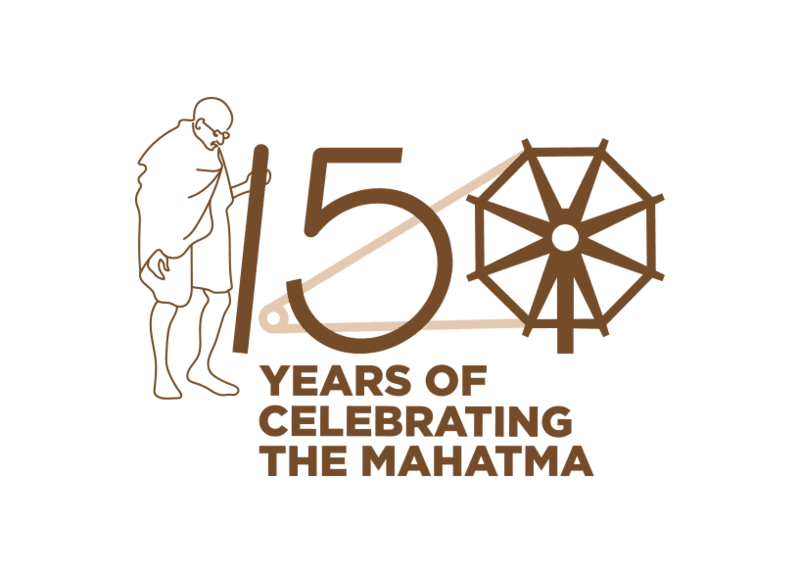 The Rashtriya Ekta Diwas was observed on 31st October 2017 on the occasion of the birthday of Sardar Vallabhbhai Patel, the Iron Man of India with all staff taking the Rashtriya Ekta Diwas Pledge. Vigilance Awareness Week – 2017 was observed at NCDIR from 30th October to 4th November 2017. On 30th October 2017, NCDIR as an organization adopted the E - Integrity Pledge and was awarded a ‘Certificate of Commitment’ by the Central Vigilance Commission and the staff of NCDIR took the ‘Integrity Pledge’ in office. A Quiz on ‘Prevention of Corruption’ was arranged for the staff on 3rd November 2017. Hon’ble Union Minister for Health and Family Welfare Sh J.P. Nadda released the National Ethical Guidelines for Biomedical and health Research Involving Human participants, National Ethical Guidelines for Biomedical research involving Children and National Guidelines for Stem Cell Research. Smt. 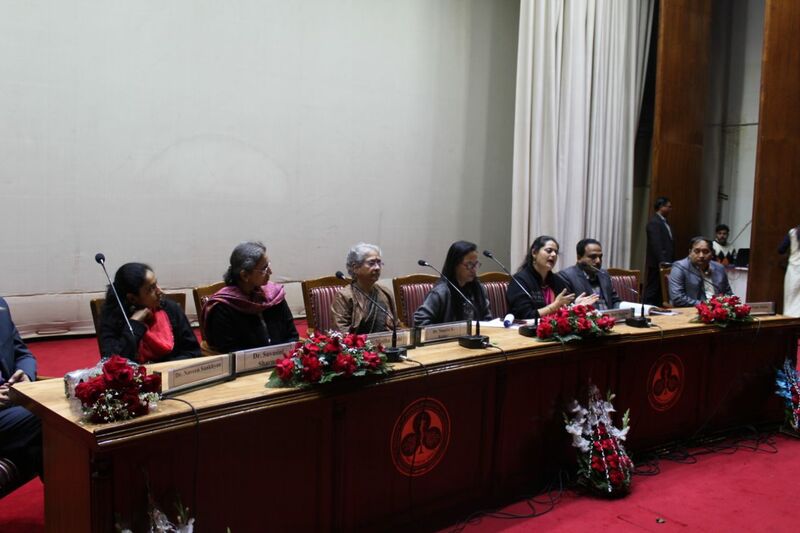 Anupriya Patel, Hon’ble Minister of State for Health & Family Welfare, Dr. Soumya Swaminathan, Secretary DHR and Director General, ICMR and other dignitaries were present during the occasion. An awareness workshop on the topic “Use of Web of Science and Endnote in Research” was conducted by Faculty / Facilitator Mr. Manivannan R from Clarivate Analytics, Chennai on 6th October 2017 at NCDIR. The Scientific staff of NCDIR attended the workshop. Subsequently NCDIR staff have been provided access to Web of science database to review and provide feedback to ICMR on the Web of Science for future recommendation for subscription. Sh. V.K.Gauba, Joint Secretary – DHR and Sr. DDG (A) – ICMR visited NCDIR on 15/09/2017 along with DHR Officials Shri Raj Kumar, DS, Dr. Harmanmeet Kaur, Scientist C, and Dr. Kavitha Rajsekar, Scientist D.
The Director briefed about the working of NCDIR and the status of sanction of budget for the projects at NCDIR. Sh. Gauba appreciated the innovative ideas of projecting the data analysis for the public. Dr. Soumya Swaminathan, Secretary DHR and DG, ICMR visited NCDIR on 8th September 2017. She was briefed about the ongoing activities at NCDIR. Inaugurated the North wing of NCDIR. ICMR and THSTI jointly organized a meeting of experts from over 20 ethics committees across the country in order to make an effort for developing harmonized forms to be used by institutional ethics committees in India. It is expected that once common forms are prepared this would greatly streamline the functioning of ethics committees and would help improve review of research. The students from Delhi Public School (DPS), Bengaluru North visited NCDIR on 8th August 2017 to understand role of ICMR in prevention of vector borne diseases with specific reference to Dengue. 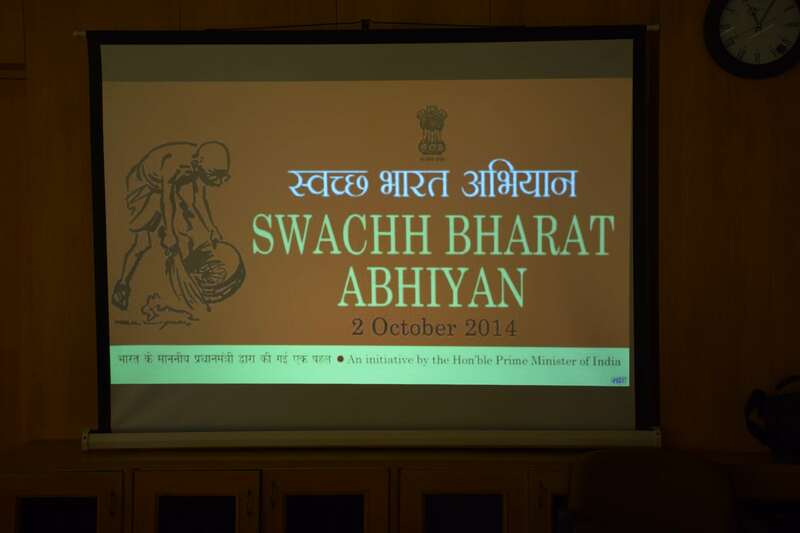 Dr. Prashant Mathur, Director presented on Swacch Bharat Abhiyan, Health with good hygiene practices and environmental sanitation. Dr S K Ghosh, Scientist G, National Institute of Malaria Research (ICMR) delivered a talk on ‘Vector Borne Diseases with Specific Reference to Dengue’ and the students were taken to the lab where he briefed about the research activities. 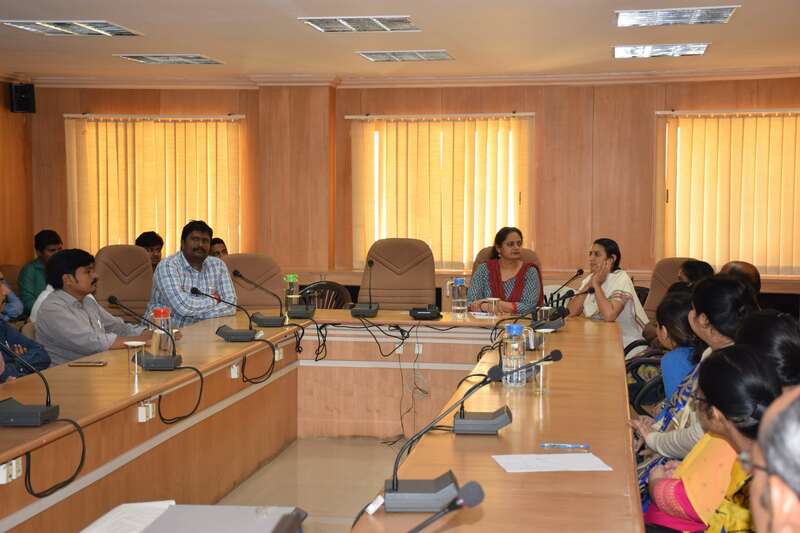 Cancer Registry Meeting was held in RCC, Thiruvananthapuram in the presence of Shri Rajeev Sadanandan, Additional Chief Secretary (ACS), and Ministry of Health & Family welfare, Govt. of Kerala and Dr. G.K.Rath, Chairperson of the Scientific Advisory Committee of NCDIR. Report of Thiruvananthapuram PBCR (2012-14) was released during the meeting. Collaborators from several hospitals (sources of registration for the Population Based Cancer Registry) have also attended the meeting. Workshop on Population Based Stroke Registry(PBSR) on August 2nd 2017 at NCDIR, Bengaluru. A workshop was conducted for the Investigators from the collaborating centres of the project “Development of Population Based Stroke Registry (PBSR)” highlighting the methodology and implementation plan. The meeting was also attended by the members of the Research Area Panel on Stroke of NCDIR and the experts in the field. The purpose of the training was to train the investigators of ten implementing Agencies on the National NCD Monitoring Survey protocol and methods. Discussion was held to clarify the issues on Survey implementation and feedback was taken on survey tools particularly interview schedules translated in eleven regional languages and handhelds for finalization. Workshop 3 : Regional Cancer Centres along with Centres using HBCRDM S/w on 27 to 28 July 2017 held at SGPGIMS, Lucknow. The third training workshop organized at Sanjay Gandhi Post Graduate Institute of Medical Sciences, Lucknow, from 28th -29th July 2017 was held to sensitize multiple stakeholders at state level in Uttar Pradesh on the importance of cancer registration, cancer notification and cancer research to address the cancer burden within the state and the nation. Fourteen centres from northern part (Uttar Pradesh, Bihar, Rajasthan, Himachal Pradesh, Jammu and Kashmir, Punjab, Chandigarh and Uttarakhand) of India participated in the workshop. The workshop was held to train and guide on data collection and executing the Hospital Based Cancer Registry and Patterns of Care and Survival Studies. The second workshop had the participants from the centres under National Cancer Registry Programme from the central, eastern and north eastern (Gujarat, Maharashtra, Chhattisgarh, Tripura, Mizoram, Manipur, Assam, West Bengal and Odisha) States of India. Workshop on Public Financial Management System(PFMS) at NCDIR, Bengaluru on 21 July 2017 organized by ICMR - Ministry of Health and Family Welfare, Govt. of India. 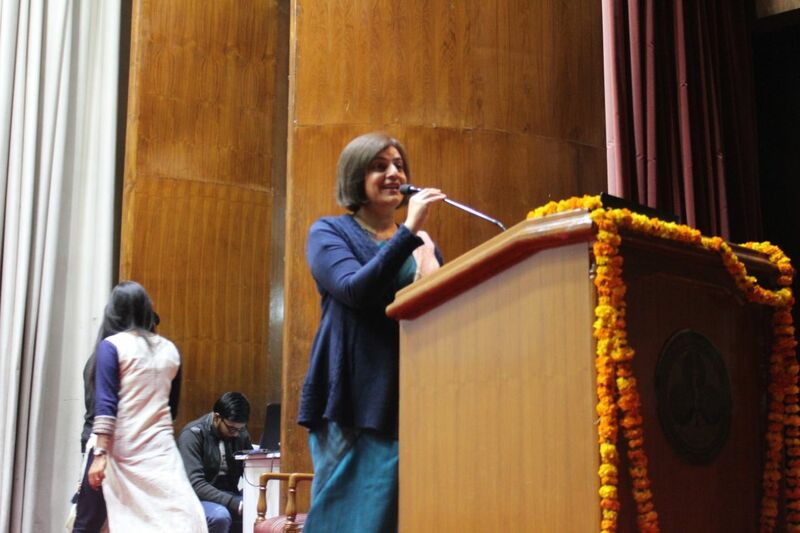 ICMR - Ministry of Health and Family Welfare has organised workshop on PFMS under the chairmanship of Ms. Ritu Dhillon, IAAS, Sr. Financial Advisor, ICMR, New Delhi. The hands-on training was given by PFMS team of MoHFW for the nodal officers of the following institutions. 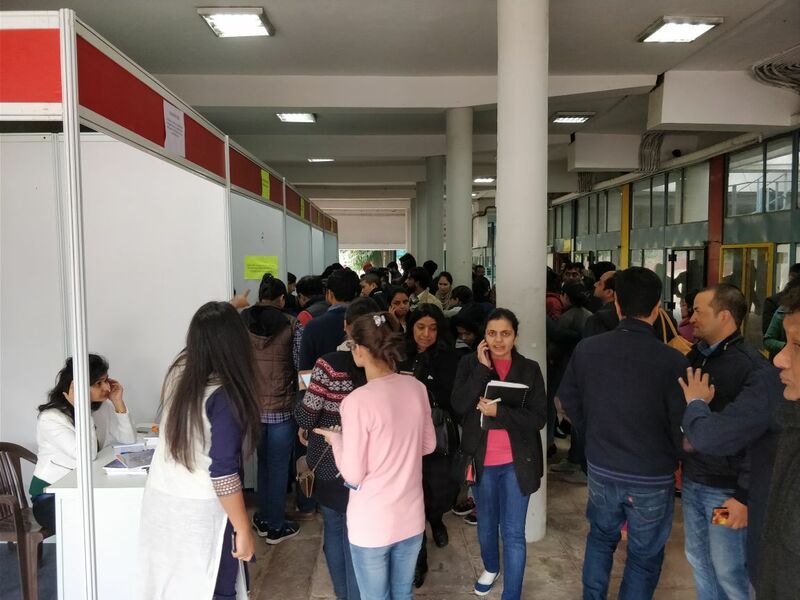 The students from Delhi Public School (DPS), Bengaluru North and the students from Italy who were in DPS North in connection with exchange education programme visited NCDIR to understand the role of ICMR in prevention and cure of tropical diseases and research. Dr. Prashant Mathur presented the overview of ICMR with specific reference to prevention and cure of tropical diseases and research. 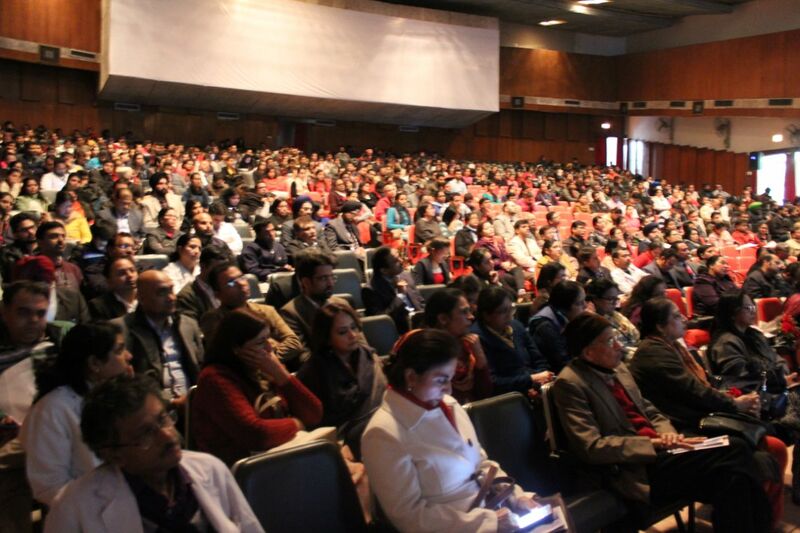 The team interacted with doctors to understand the medical scenario in India. The workshop was held to train and guide on data collection and executing the Hospital Based Cancer Registry and Patterns of Care and Survival Studies. The centres were divided into three group and three workshops were held to ease the training of the participants. 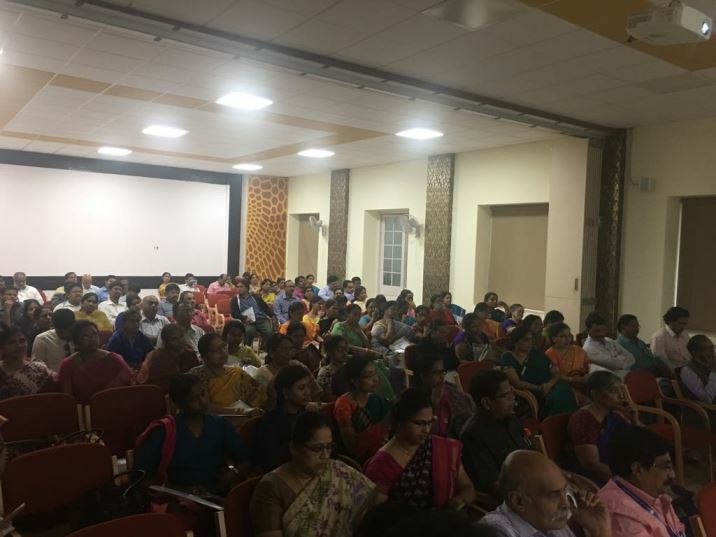 In the first workshop twelve centres from southern part (Puducherry, Tamil Nadu, Kerala and Telengana) of India participated in the workshop. The team from National Release Centre of Electronic Health Record standards (NRCeS), C-DAC, Pune demonstrated the SNOMED CT (SNOMED clinical terminology) framework and C-DAC’s toolkit for SNOMED CT (CSNOtk). The NCDIR technical team set up the environment for the integration of SNOMED CT with e-mortality application using CSNOtk toolkit with the support of the NRCeS team. Advisory Committee meeting for the finalization of National Ethical Guidelines for Biomedical and health Research in human participants, 2017 on 24th May 2017. Several meetings and rounds of discussions were held before the finalization of the guidelines. International Yoga Day was celebrated on 21 June 2017 in the Auditorium of Regional Occupational Health Centre involving all the employees of three ICMR centres in the premises. Dr Raghavendra Bhat, Assistant Professor from S-VYASA University, Bengaluru explained the importance of yoga in daily life. Technical Working Group meeting was held with the objective of reviewing the progress of the National NCD monitoring Survey and results of the Pilot study for the National NCD survey. The meeting was held to review the readiness of the app/handheld for collecting data and plan the management of the project, roll out plan and formulate action points. The second feasibility workshop was held at IGIMS Patna which is the Regional Cancer Centre having major load of cancer patients from the area. The workshop was planned with the objective of measures which need to be taken to assess the burden of cancer as incidence of certain sites of cancers is found to be high in areas near Gangetic belt. The consultation meeting was aimed at inviting comments and feedbacks from various experts on cancer and public health as well from all parts of the country in order to develop a research agenda to address the cancer problem in North East India. 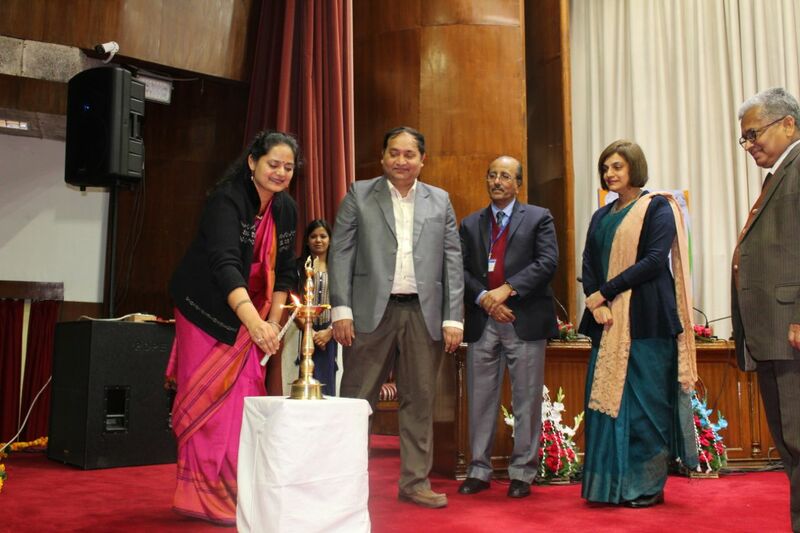 An All India Workshop on Software Modules Developed by NCDIR, Bengaluru was organized by the National Centre for Disease Informatics and Research, Bengaluru at Dr. B. Borooah Cancer Institute, Guwahati. The objective of the conference was to explain the features and clarifying problems encountered for the individual software modules, showcase the outputs generated by the software and to identify potential institutions for implementation of the software modules. A second workshop of the project was held at Gurgaon - Medanta Hospital where centres involved in diagnosis and treatment of cancer at Gurgaon, Faridabad, Rohtak, Sonepat, Palwal and New Delhi participated. The workshop was held with the objective of providing complete coverage of registration of cancer cases who are residents of Haryana state and seeking the treatment at hospitals in above places. A draft consolidated report for Regional Cancer Centres for the years 2014 and 2015 from 14 Regional Cancer Centres has been prepared and was reviewed by the Research Area Panel members. Sh Navdeep Rinwa, Joint Secretary, Department of Health & Family Welfare, Ministry of Health and Family Welfare also participated in the meeting. Issues in quality control of data, creation of regularly functioning tumour board in the institutions were discussed. It was suggested that Cancer notifiability issue has to be taken up with the respective state authorities. The meeting was held to discuss issues and implementation plan on roll out of food fortification in identified food commodities. 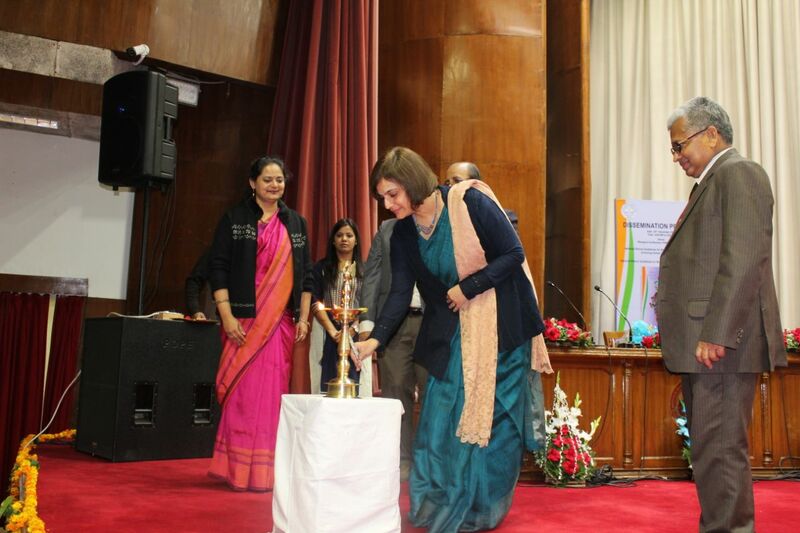 The participants were from different industries from Tamil Nadu, Karnataka and Andhra Pradesh, representatives from Ministry of Women and Child Development, Government of India, FSSAI, New Delhi.